""You have to read this. " - Rainbow Rowell, author of "Eleanor & Park"
In his follow-up to the "New York Times" bestselling" Every Day, " David Levithan, coauthor of bestsellers "Will Grayson, Will Grayson "and" Nick & Norah's Infinite Playlist, " crafts a novel that the "Los Angeles Times" calls open, frank, and ultimately optimistic. Based on true events and narrated by a Greek Chorus of the generation of gay men lost to AIDS "Two Boys Kissing" follows Harry and Craig, two seventeen-year-olds who are about to take part in a 32-hour marathon of kissing to set a new Guinness World Record. 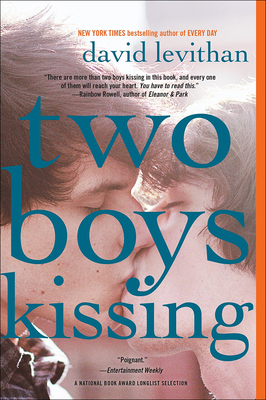 While the two increasingly dehydrated and sleep-deprived boys are locking lips, they become a focal point in the lives of other teens dealing with universal questions of love, identity, and belonging. DAVID LEVITHAN is a children s book editor in New York City and the author of several books for young adults, including "Boy Meets Boy, Love Is the Higher Law, "and "Every Day." He coauthored "Will Grayson, Will Grayson "with John Green," " and "Nick & Norah s Infinite Playlist, Dash & Lily s Book of Dares, " and "Naomi and Ely s No Kiss List" with Rachel Cohn. "From the Hardcover edition.""